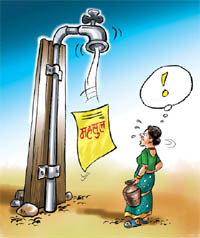 Kathmandu: The customers in the tariff defaulters' list of the Kathmandu Upatyaka Khanepani Limited (KUKL) company have denied to clear their tariff stating that there has been no water supply to their tap connections. They blamed that the company responsible of water supply services has tried to cheat the general public by making public the tariff dues. “Why to pay tariff when the tap has been dry for the past 25 years?” asked Gopal Kachyapati, proprietor of Kantipur Hotel, Durbar Marg which is in the defaulters' list of KUKL for not clearing water tariff, adding, “We do not care if the company cuts off the connection that do not supply water anyway.” He accused the company of making public the due amount without proper calculation. Kachyapati told that the company has neglected the repeated written applications from the entrepreneurs of Durbar Marg to supply water or cut off the supply lines. “It is not appropriate to show tariff dues of Rs. 0.25 million for 18 months of that tap which has remained dry for the past 25 years,” said Kachyapati, adding, “Not only drinking water but street lights and sewerage management is in disorder in Durbar Marg.” Works of sewerage management is being done by forming ‘Durbar Marg Development Board’ in local initiation after the KUKL failed to manage sewerage in Durbar Marg. They have accused the KUKL for trying to cheat the consumers by making public the tariff dues without monitoring its service once. All the customers who are in the tariff defaulters' list have claimed that their taps have been dry for the past 5 to 15 years. However, KUKL has denied the accusation of no water supply. Rameshwor Shrestha, spokesperson at the KUKL told that the KUKL has not forced the consumers to pay water bills without having water supply. He told that the company will rebate the tariff fee of the consumers who visit the company with the proof of no water supply. “They are exaggerating some cases for to avoid paying the due and some are trying to get political backing for this,” said Shrestha. “If some one comes up with complains of no water supply, we will fix the problem immediately,” he added.